Guangxiao is one of the four famous pagodas in Guangdong Province, it has a history of 1,500 years. 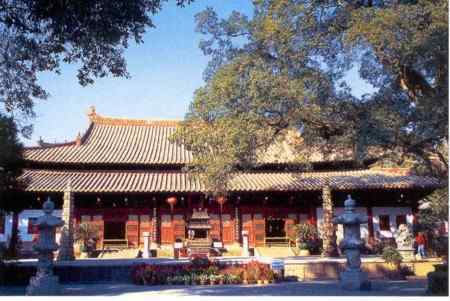 It was the original location of the residence of Zhao Jiande, king of the Nanyue State (approximately lOOBC). During the Three Kingdoms period (220-265 AD) Yu Fan the classicist lectured here for a full thirty years, hence it's other name the Yu Garden. It was during the Southern Song Dynasty (11261279AD) that it became known as the Guangxiao Pagoda. In the year 676, during the Tand Dynasty, Huineng who later founded his own sect of Buddhism, came to this pagoda to discuss Buddhist teachings with the monks and was converted. The Sixth Master Hall is in memory of him. In the pagoda, there are the Mahavira Hall, Sleeping Buddha statue, bodhi trees and East and West Iron Pagodas. The cast-iron pagodas ,Xitie Ta and Dongtie Ta , date back to the 10th century , standing at the east and west ends of the hall are the oldest of their kind in China.